This is my second attempt at doing the Trifecta Writing Challenge, and this week I decided to pull out all the stops and tackle a question that has troubled laymen and academics alike for ages: what do Polish people think about when they’re sad? (I’m starting with some levity because my story feels a little depressing this week). If you agree, why don’t you head on over to the Trifecta Writing Challenge page and try submitting something a little bit happier for us to read, huh? Seriously, though: Comments, criticism and links to your stories are welcome below. Every night the cinema plays the same film; I have seen it a hundred times, this beautiful work by Kieslowski. I don’t watch it every night, of course – it doesn’t work like that – but I try to come upon it by accident, instead. I get my tea and read the paper, then pass the theater on my way home; or I go to see Mrs. Zobcsack and inquire about her cats, then run to fetch them food at the shop – and when I see the light from the cinema spilling across the street I allow myself the distraction and go in to watch. 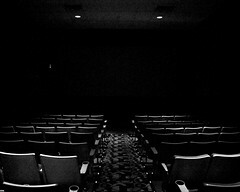 Someday I will look around the theater as the film plays and spy a beautiful woman. She may catch me staring and smile. Perhaps I will introduce myself – say, “I am Witek” and she will say, “like in the film?” It will be a great coincidence and she will fall in love with me. It is hard to be at home when I know the film is playing. What if she is there tonight, this woman? What if I miss her? What if I miss her forever? Blind Chance has ruined me, but I will watch it every night, now, to be safe. This is kind of a sad take on the prompt. He’s so trapped by the idea of what could be that he isn’t really living for today. He’s so set how he will meet the beautiful woman that it makes me wonder if he would recognize her if he met her some other way; like in line at the grocery store. I know – I didn’t start out with that in mind, but that’s definitely where it ended up. Maybe next time I can come up with something cheerier haha. Thanks for the comment! Yes, it’s a little sad, but there are people like this. They live for a dream that may never happen. Nicely done. Well written! This is a sad situation, but it doesn’t have to be a person we dream of eluding us, it can be anything. Great job! Awww his life is sad. Awww his life is so sad. I really love your voice and your use of first person. This piece really pulled me in. I especially like the way he ends up at the theater on “accident”, arranging his life in order to pass by. Terrific piece. This was a thought-provoking piece. I am intrigued by the idea of the little ways we try to have an effect on fate. Thanks for sharing this. We hope to see you back for new challenges. There’s something lovely about his vision of accidentally stumbling onto life and the world despite the fact that he seems to be hiding from life at the same time. Nicely done. At least it’s simple, haha, and who knows? Maybe he’s right? This was absolutely lovely. I think you hit the English-as-second-language tone perfectly. I also think you captured the contradictory, hopeful-sad vibe of a lot of Slavic literature. Amazingly well done.